Social influence-ranking service Klout is an odd thing indeed: it thinks Blackberry users are more important than Android Users, but believes our very own Kyle Wagner is a good mom, too. In truth, its rankings don't intuitively seem to make much sense—and here's some evidence that supports that statement. Over the course of four consecutive days of polling for 30 seconds every 5 minutes from Twitter's spritzer-level of access, we collected a total of 3,598,060 geotagged tweets via the random public timeline. These geotagged tweets were then bundled into their respective countries of origin, and the resulting set of country-bundled tweets were sampled randomly for up to 1000 users. The resulting sample of users were queried using Klout's API. 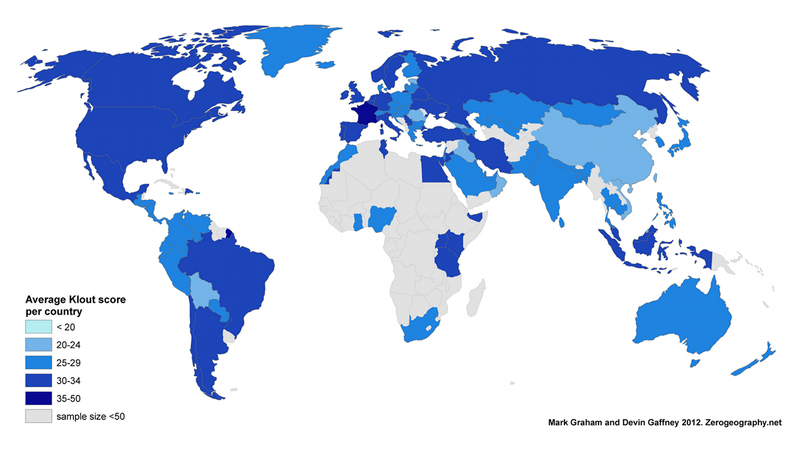 He then plotted the average Koout score of each country, color-coding the map so that darker blue corresponds to a higher score. Top of the tree? France, with an average score of 37.8. Filling second and third spot are the UK (34.9) and Sweden (34.8) respectively. The US limped in to take 10th place with a score of 33.